IoT-Optimized Networks Are Coming – Do You Have the Right Devices? At CTIA in Las Vegas this week you will no doubt hear a lot about the deployment of LTE Category 1 (Cat1). LTE Cat1 is a next generation cellular technology optimized for Internet of Things (IoT) applications that typically require lower bandwidth and less power consumption. Mobile network operators are moving quickly to roll out these networks to meet the demand for IoT connectivity. CalAmp has been working closely with the carriers to align our product roadmap with LTE Cat1 network deployment and we are excited to be among the first to deliver LTE Cat1-enabled telematics devices in the fourth quarter of 2016. CalAmp’s LTE Cat1-enabled LMU-2600 and 4200 series products will help future-proof IoT and technology investments while maintaining connectivity with 3G fallback. 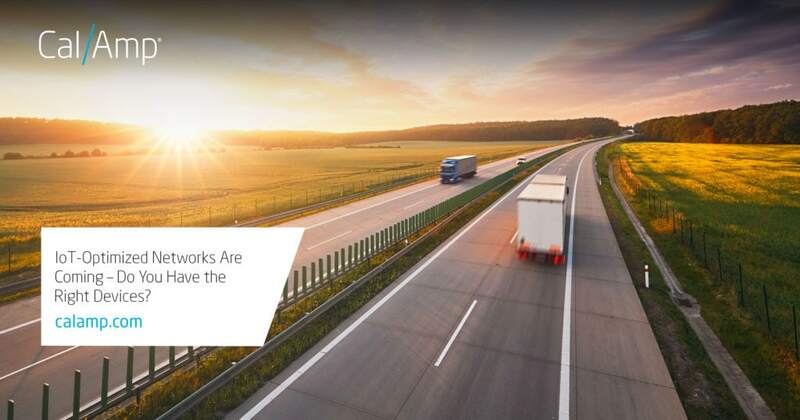 These powerful devices will power the next generation of IoT applications for connected vehicle, fleet management, insurance telematics, enterprise trucking and mobile workforce management, among others. Read our announcement about our LTE Cat1-enabled LMU-2600 and 4200 series products here or visit us at booth #5332 at CTIA from September 7 – 8 in Las Vegas.